This product requires the base game Sniper Elite III. 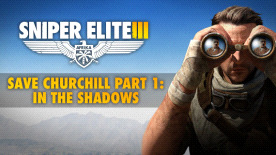 Save Churchill Part 1: In Shadows is the atmospheric first episode in a series of three new Sniper Elite 3 campaign missions where players must foil a plot to assassinate inspirational British Prime Minister, Winston Churchill. Inside the shadowy city of Siwa lies the intel that could reveal his assassin, but this is not the place that Karl Fairburne remembers; the haunted surroundings are shrouded in smoke, her city walls battle-scarred by constant bombardment and assaults. Fairburne must infiltrate the garrison, sow chaos among the enemy, and reveal the Axis plans that could end Churchill’s – and Allied – resistance for good. Sniper Elite III is required to play this DLC.